Dementia is one of the major causes of disability among older people worldwide. 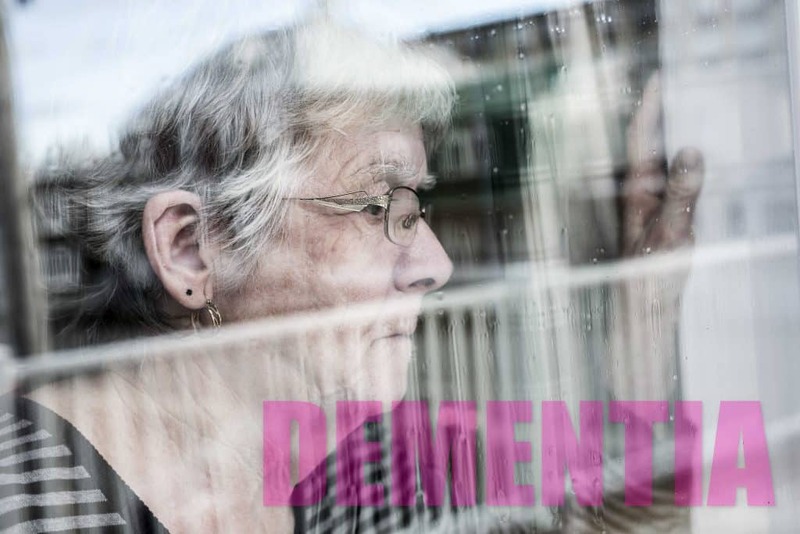 There is often a lack of awareness and understanding of dementia and the stages of progression. 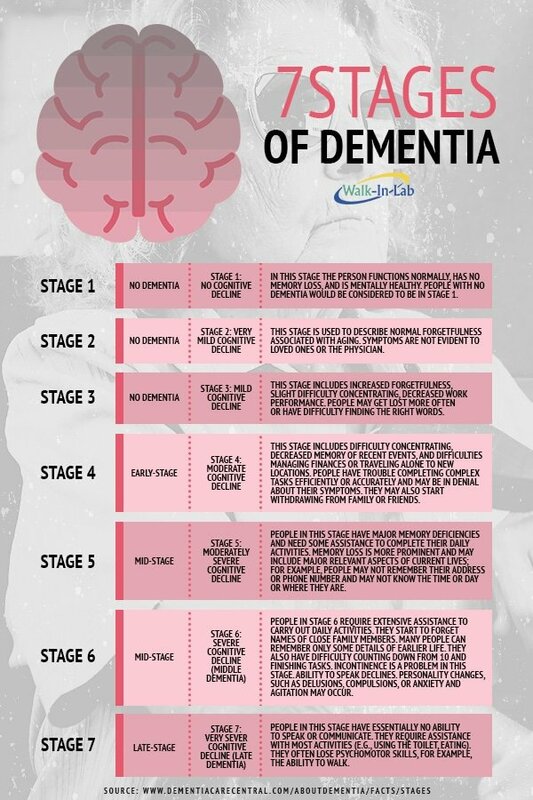 This info graphic outlines the seven stages of dementia, symptoms and conditions. There are many other causes of dementia besides Alzheimer disease. A range of traditional laboratory tests are used to rule out deficiencies and other diseases and conditions that could be affecting the person’s memory. This panel includes many of the tests ordered for this purpose. Electrolytes Sodium- is important in the body’s water balance and the electrical activity of nerves and muscles and one of the major salts in body fluid. Potassium Helps to control the muscles and nerves. Chloride- Similar to sodium, chloride helps to maintain the body’s electrolyte balance. Carbon Dioxide- Total Used in detecting, evaluating, and monitoring electrolyte imbalances. Calcium- A mineral essential for development and maintenance of healthy teeth and bones. It is important also for the normal function of nerves, muscles and blood clotting. A TSH (Thyroid Stimulating Hormone) test also known as the Third-generation TSH is commonly ordered to help evaluate a person’s thyroid function and aid in the diagnosis of thyroid disorders such as hyperthyroidism or hypothyroidism. A T4 test measures the amount of a particular hormone, T4 or Thyroxine, produced by the thyroid gland. T4 helps maintain the body’s metabolism, temperature, and heart rate. Vitamin B12 is an important vitamin for many bodily functions, such as brain health, blood cell production, proper nerve functioning, and tissue and cellular repair. C-Reactive Protein (CRP) Quantitative blood test determines whether a high or increasing amount of CRP in your blood suggests an acute infection or inflammation. CRP is a protein produced by the liver. Higher than normal concentrations of CRP are often an indicator of infection or inflammation in the body. This test can help determine if an infection is present but not the source of the infection. Sedimentation Rate (ESR) Westergren – Erythrocyte sedimentation rate (ESR) is an easy, inexpensive, nonspecific test that has been used for many years to help diagnose conditions associated with acute and chronic inflammation, including infections, cancers, and autoimmune diseases. ESR is said to be nonspecific because increases do not tell the health provider exactly where the inflammation is or what is causing it, and also because it can be affected by conditions other than inflammation. Because it is nonspecific, ESR is typically used in conjunction with other tests. ESR aids in diagnosing two specific inflammatory diseases, polymyalgia rheumatica and temporal arteritism, a high ESR being one of the main test results used to support the diagnosis. The test is also used to monitor disease activity and response to therapy in both polymyalgia rheumatica and temporal arteritism.